Enjoy the Elegance of the Old West in our almost fully restored 1875 home in Virginia City, Nevada. The restoration never really ends here, but the guest rooms are finished! We share a full gourmet breakfast and afternoon tea time with guests who enjoy wandering the museums and wooden board walks of historic Virginia City. All of us baby boomers will remember Virginia City as the closest town to the Cartwright's Ponderosa Ranch in the old Bonanza TV western. The real thing is quite different, but worth a trip on so many different levels. 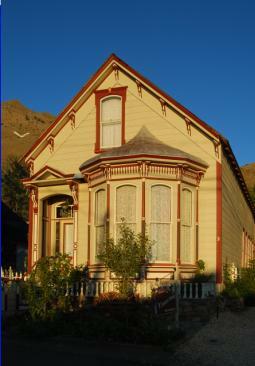 A Dozen Distinctive Destinations winner in 2009, Virginia City's historic architecture was honored by the National Trust for Historic Preservation. Virginia City is home to the "last one standing"; the Fourth Ward School, now museum, which is unique in the USA. The B Street House has three upstairs guest rooms with private baths, a library and gardens for guests, and luxury amenities. Our restoration of the Henry Piper home, now listed on the National Register of Historic Places, won an award from the State of Nevada. Please visit us on www.BStreetHouse.com for more information and to make a reservation.